Abstract—This paper presents the power quality improvement in the midpoint converter based switched reluctance motor (SRM) drive using a Vienna rectifier. A conventional bridge rectifier with midpoint converter based SRM drive produces very high level of harmonics content and low power factor at ac mains. The proposed Vienna rectifier with midpoint converter fed SRM drive improves the power factor at ac mains with low current harmonics. It also provides constant dc link voltage and balanced capacitor voltages. This SRM drive with input Vienna rectifier is modeled and its performance is simulated in Matlab/Simulink environment. 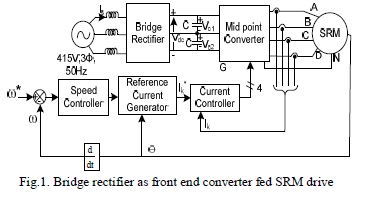 Moreover, performance of Vienna rectifier is compared with a conventional bridge topology for SRM drive. • It provides constant dc voltage. THD of input ac current. • The dc capacitors voltages are balanced. Contact us to get the IEEE base paper for free..